"A liftOver file is a chain file, where for each region in the genome the alignments of the best/longest syntenic regions are used to translate features from one version of a genome to another." . SVG Elements and CSS styles can be animated in a SVG file (see http://www.w3.org/TR/SVG/animate.html ) using the <animate/> element. I've just pushed IGVFox 0.1 an add-on for Firefox, controlling IGV, the Integrative Genomics Viewer. This add-on allows the users to set the genomic position of IGV by just clicking a hyperlink in a HTML page. The source code is available on github at https://github.com/lindenb/igvfox and a first release is available as a *.xpi file at https://github.com/lindenb/igvfox/releases. via UCSC Genome Browser project announcements: "Data from the Ensembl Regulatory Build are now available in the UCSC Genome Browser as a public track hub for both hg19 and hg38. This track hub contains promoters and their flanking regions, enhancers, and many other regulatory features predicted across a number of cell lines using annotated segmentation states" . Those new annotations are deployed by the Sanger Institute as a UCSC track hub. This hub is defined at http://ngs.sanger.ac.uk/production/ensembl/regulation/hub.txt. It provides data for the genomes defined in http://ngs.sanger.ac.uk/production/ensembl/regulation/genomes.txt. I wrote a java tool for the annotation of VCFs with those files. This tool uses the BigWig library for java ( https://code.google.com/p/bigwig/ ) and is available at: https://github.com/lindenb/jvarkit/wiki/VcfEnsemblReg. SLURM (https://computing.llnl.gov/linux/slurm/slurm.html) is The Simple Linux Utility for Resource Management . It's an open source, fault-tolerant, and highly scalable cluster management and job scheduling system for large and small Linux clusters. A patch for GNU Make version 3.81 is available as part of the SLURM distribution in https://github.com/SchedMD/slurm/blob/master/contribs/make.slurm.patch This patch will use SLURM to launch tasks across a job's current resource allocation. http://www.gnu.org/software/make/manual/make.html : The program used as the shell is taken from the variable SHELL. If this variable is not set in your makefile, the program /bin/sh is used as the shell. The argument(s) passed to the shell are taken from the variable .SHELLFLAGS. The default value of .SHELLFLAGS is -c normally, or -ec in POSIX-conforming mode. A GNU-make plug-in for the #Illumina FASTQs. Building a plug-in for the Illumina FASTQs. A function registered with make must match the gmk_func_ptr type. It will be invoked with three parameters: name (the name of the function), argc (the number of arguments to the function), and argv (an array of pointers to arguments to the function). The last pointer (that is, argv[argc]) will be null (0). the plugin must be compiled as a dynamic C library. writing #rstats bindings for bwa-mem, my notebook. 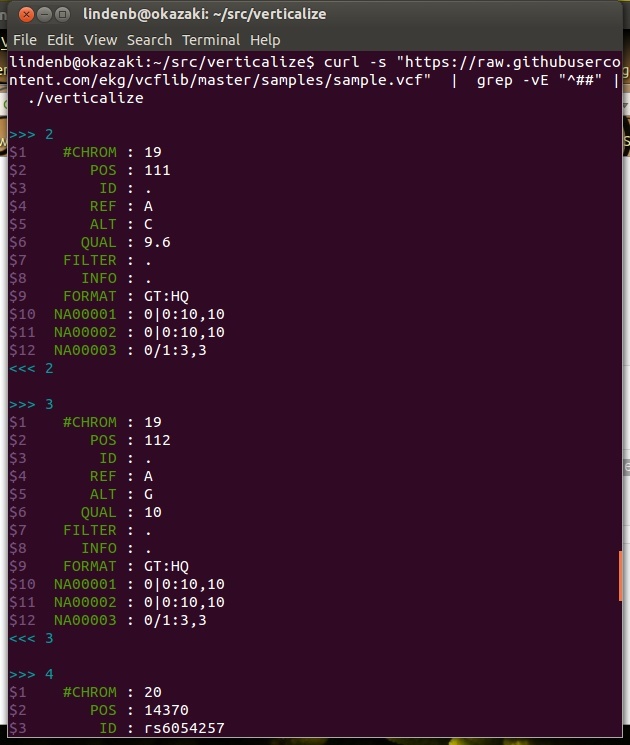 Most of the C code was inspired from Heng Li's code https://github.com/lh3/bwa/blob/master/example.c. This structure holds a pointer to the bwa-index (bwaidx_t) and to the options for bwa (mem_opt_t). This methods opens the bwa index, wrap the pointer in a 'R' tructure using R_MakeExternalPtr and registers a destructor '_RBwaFinalizer' to be called by the garbage manager. This is the workhorse of the code: it retrieves the pointer to the 'struct RBwaHandler' using 'R_ExternalPtrAddr', creates a "data.frame" with 6 columns (chromosome, position, strand, mapq, NM, secondary), maps the DNA sequence by calling bwa::mem_align1 and insert the hits in the data.frame. Now, each time 'git commit' is called, the file githash.h for the previous git-commit will be deleted ! Pushed : makefile2graph , creating a graph of dependencies from GNU-Make. I pushed makefile2graph at https://github.com/lindenb/makefile2graph. This is the standalone and 'C' implementation of a program I first wrote in java in 2012. 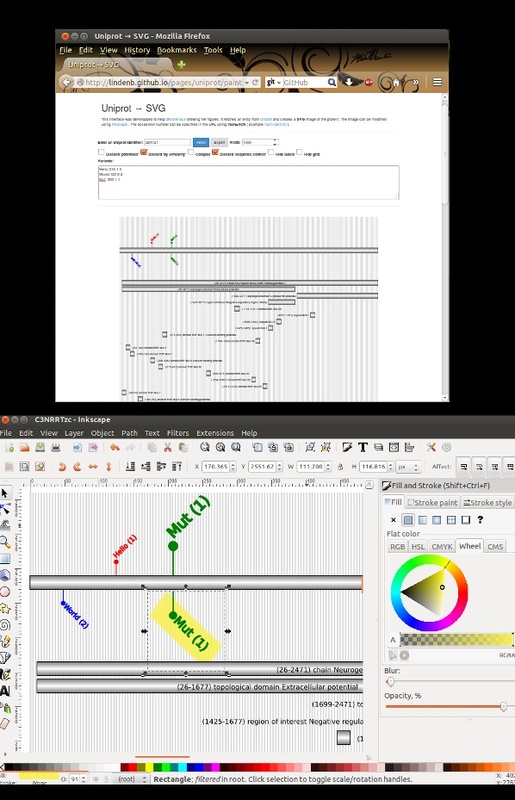 The program creates a graph of dependencies from GNU-Make and its output is a graphiz-dot file or a Gexf/Gephi-XML file. FYI: this morning, I pushed verticalize on github. Verticalize is an everyday simple command to 'verticalize' delimited files: https://github.com/lindenb/verticalize. Breaking the " same origin security policy" with CORS. 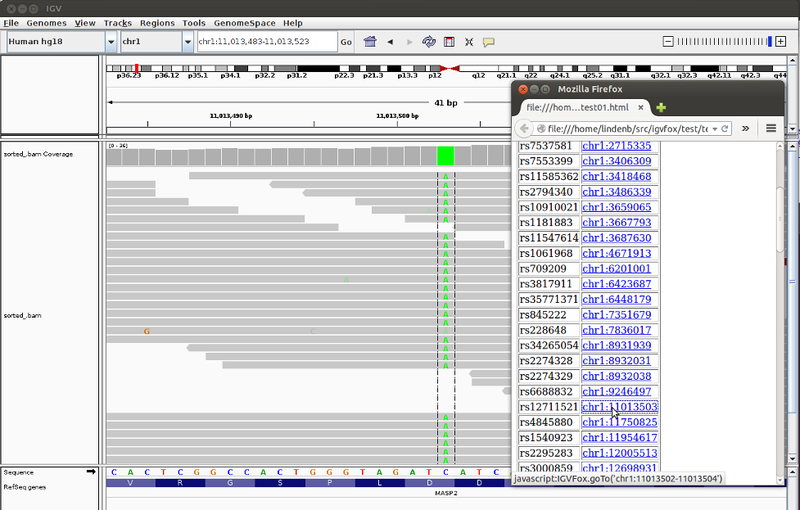 An example with @GenomeBrowser / DAS.